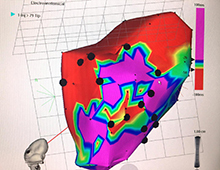 3-dimensional electrochemical mapping was used to target ixmyelocel-T cell therapy to damaged areas of hearts in patients with end-stage heart failure. Patients with heart failure who received an experimental stem cell therapy experienced a reduced rate of death, hospitalization and unplanned clinic visits over the next year compared to a placebo group, according to results presented at the American College of Cardiology meeting in March in Chicago. The results of the ixCELL-DCM study were published online by The Lancet. It was reportedly the largest cell therapy study done in patients with heart failure so far (58 treated vs 51 placebo). “For the first time, a clinical trial has shown that administration of a cellular therapeutic results in an improvement in cardiac outcomes based on a pre-specified analysis,” an editorial accompanying an editorial accompanying the paper in The Lancet says. In the ixCELL-DCM study, which began in 2012, doctors removed some of each patient’s own bone marrow and sent it to Vericel’s laboratory in Michigan, where it underwent a two-week process to selectively expand two types of cells: mesenchymal stem cells and anti-inflammatory macrophages. Researchers think that these cells may help the heart remodel and function better, but they do not directly rebuild the heart muscle. Investigators also monitored structural changes in the heart such as left ventricular ejection fraction (a measure of the heart’s pumping capacity) as well as a patient’s ability to walk for six minutes, but did not see significant differences in either of these measures. Effects beyond one year were not reported. The most recent patient’s 12 month follow-up was in February 2016.